IABCLA board members and guests at the chapter’s holiday mixer. Thank you to all who attended IABCLA’s holiday mixer on November 29 at Pearl’s Rooftop in West Hollywood! The happening was attended by chapter regulars, as well as several new faces. As part of the function, the chapter gathered socks that were donated to our homeless neighbors in LA. Please contact board member Tery Amaya if you’d like to add to the collection. She can be reached through LinkedIn. The board is now working on a variety of programs for 2019, including other mixers, Coffee Connections, and professional development events. We will, of course, share more details as they become available. We appreciate all of your support this year, and we wish you and your loved ones the very best this holiday season! Thank you to all who attended IABCLA’s professional development event, Communicating Big Changes, on November 8 in Santa Monica! Experts in branding, internal comms, marketing, and community-building shared their experiences communicating to their stakeholders, and thereby enabling understanding, engagement — and success. IABCLA’s next happening will be a holiday mixer on November 29 from 6 p.m. to 8 p.m. at Pearl’s Rooftop in West Hollywood. Click here to sign up! 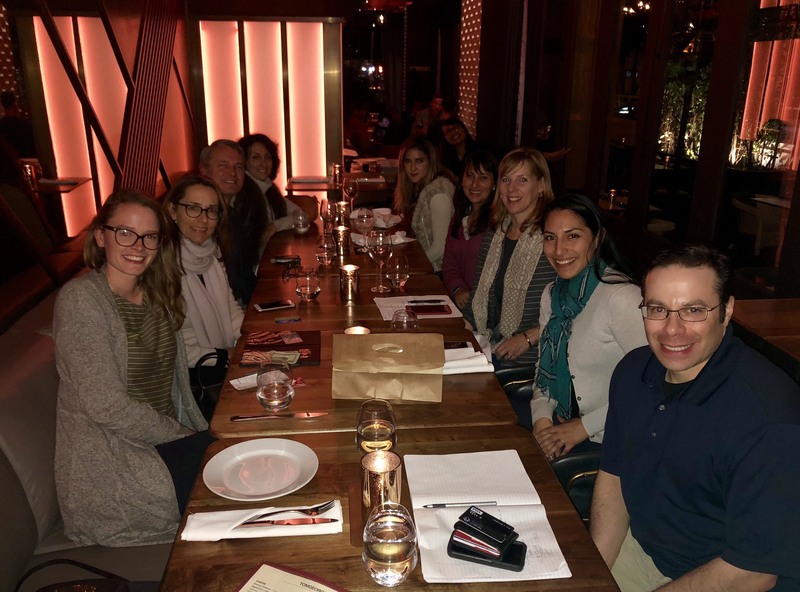 We hosted our first event of 2018 on February 21! 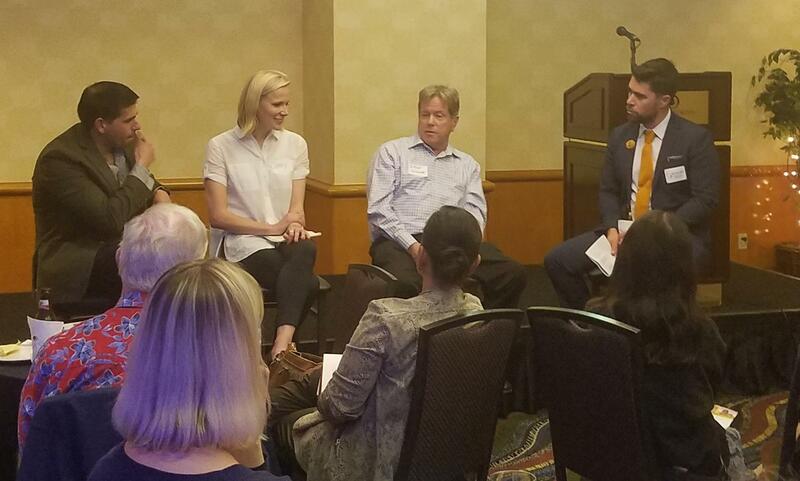 Julie Wright, president and founder of (W)right on Communications, moderated our Dine & Discuss focused on the newest Facebook algorithm changes and how that impacts brand strategy. If you don’t already know, the Facebook algorithm, nicknamed the “friends and family update,” favors content from your friends rather than from businesses. This change pushes for businesses to pay for boosted content in order to still be seen. Although paid boosted content can be very valuable, Julie advises that there’s still a great opportunity to be seen through organic content – that is if you are creating the right kind. In order to still reach audiences amidst the algorithm change it is crucial to create content that fosters engagement, meaning content that encourages comments, conversation and sharing. 1. Avoid yes or no questions: Julie says to think of social media as a cocktail party. Asking yes or no questions at a cocktail party leaves room for a one word answer and doesn’t allow for the conversation to flourish. Instead, try to ask questions that encourage a longer response and more engagement. 2. Focus on nostalgia: This is great for unique content creation. For example, take part in #ThrowbackThursdays or #FlashbackFridays. 3. Focus on storytelling: Posts that tell a story are more engaging and interesting. 4. Feature real people: Whether this means using user generated content or posting about your company’s employees, showcasing real people and real emotions creates engaging content. 5. Use Facebook Live: Facebook Live achieves 6x the interaction than organic content. Followers are notified when a buisness goes live, encouraging more viewers to watch and engage with the video. Furthermore, the video can live on as a post on your page allowing followers to watch the video long after it was recorded. Julie advises to still prep before going live: decide on an introduction, have a focus for the video and end with a call to action. 6. See First option on Facebook: Facebook users have the ability to check off a “see first” option for a Facebook page. This guarantees that your page’s content will have priority for showing in their newsfeeds. Julie says not to be afraid to ask your followers to check off this option for your page! For example: “If you want all the latest news on our upcoming event, make sure to check off the “see first” option on our page….” More information on how to set it up is here. 7. Turn on the Audience Optimization setting: Facebook allows you to improve your organic visibility on posts by turning on this function in your settings. This allows you to target your posts to specific segments of your page’s audience based on their interests! An easy and effective tool. More information on how to use the function is here. We want to thank Julie for the invaluable insight and to all those who could make it last night! We all enjoyed great food and even better conversations. To those who couldn’t make it, we hope the above tips will help get your social media strategy focused in the right direction! Join us at our next IABCLA event: Coffee Connection on March 3! June 15, 2011…IABC-LA welcomed members to the chapter’s end of the year celebration in the spirit of true kinship in a lavish 1920’s art deco setting at The Oviatt Building Penthouse in downtown Los Angeles. Past Chapter President, Christie Ly produced an outstanding event. We stepped into the historical past of L.A. while hearing keynote speaker, Father Greg Boyle, founder of HomeBoy Industries http://www.homeboy-industries.org who has gained significant respect for his model program for at-risk inner city youth. Paula Cassin, continuing as L.A. Chapter President for the 2011-2012, and Father Greg both spoke about the importance of kinship and connection, not only within the business side of things, but within our community. The evening had that magical quality when guests rode up the detailed wood-paneled elevator to arrive in another world within the Oviatt Penthouse suite. After cocktails and roaming around the suite to see autographed headshots of Errol Flynn and Leslie Howard, Parisian-inspired 20’s décor and artworks… guests mingled and chatted before going out to the beautiful large private patio underneath L.A. skyscrapers for the June Gala festivities. Rebecca Mikkelsen, Social Media Chair extraordinaire (2010-2011) welcomed Dana Edler, Communications Specialist, JPL, Acquisitions Division, to her first IABC event. Dana is taking on the Membership Chair position this year and we welcome Dana to the board. For some light-hearted dinner conversation, T.J. Stevko of Mercer, Paromita Ghosh, chapter volunteer Geoff Thomas (with new haircut! ), Dana and I talked about our favorite news sources, earthquake preparedness and the end of the world(!) which did not come months ago … T.J. had the best marketing shenanigans story …“we’ll take care of your pets for a fee if the world comes to an end for you.”! Pamela Corante-Hansen, Membership Chair (2010-2011) treated guests to an engaging and humorous five-minute version of the L.A. Conservancy’s two hour tour of facts, anecdotes and historical information of The Oviatt. Pamela is a volunteer docent with The L.A. Conservancy. She brought Mr. Oviatt and his building’s history to life! 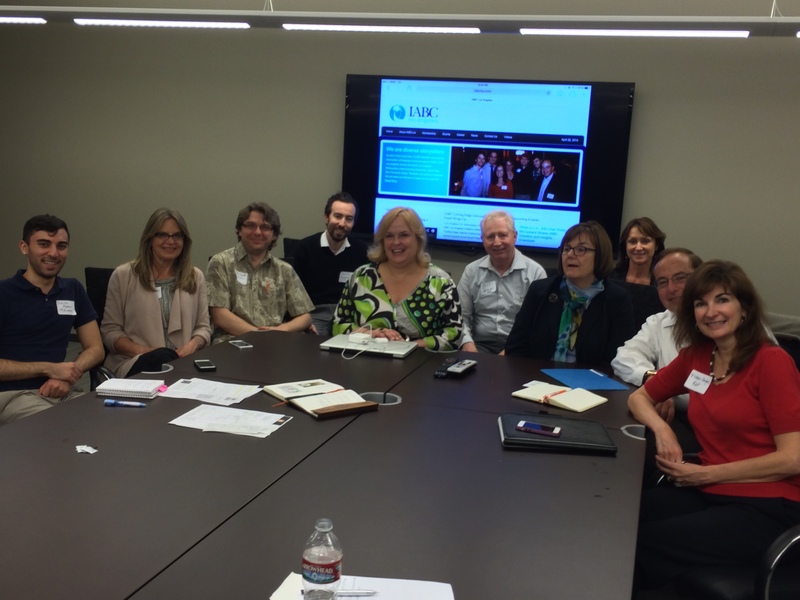 Paula Cassin noted once again, the collegial quality of the L.A. Chapter, thanked board members and chairs for their outstanding efforts, welcomed new board members and discussed the highlights of the past year. On a more serious note as the L.A. sunset created a once again magical setting, Christie introduced Father Greg Boyle. Father Greg spoke of the seeds of HomeBoy Industries, the determination to have communities understand the importance of support even in the face of severe disdain for the most at-risk youth. While Father Greg’s guests, former street gang members Robert and Jose joined us for dinner and festivities, Father Greg told stories of young men named Bandit and Puppet. Tattooed and formerly discarded youth truly make it through HomeBoy Industries yet some are not as fortunate. Father Greg writes about kinship in his book “Tattoos on the Heart” and how he gets rival gang members to work alongside each other for the promise of jobs not jail time. “I’m so tired of being tired” is the standard reply Father Greg receives when he asks a gang member why he or she finally decides to walk through HomeBoy’s doors. The chapter thanks Father Greg for his bounteous work and has made a donation to HomeBoy Industries. After a standing ovation for Father Greg, Christie and Paula announced each attendee to receive a gift back with a HomeBoy mug and an autographed copy of the book personalized to each attendee. Wow. Paula reiterated the theme of “kinship”. 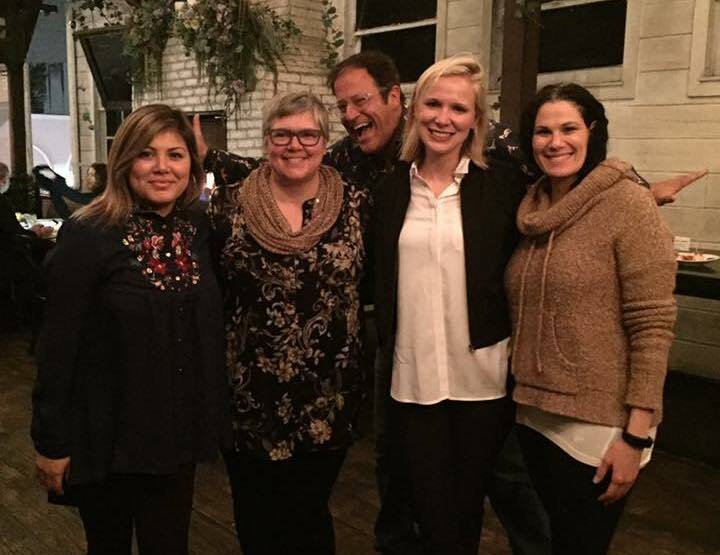 Chapter members not only enjoy tremendous connections business-wise, but we have made lifelong friends as well. Throughout the event, chapter sponsor Ed Carreon snapped professional grade pics. Finally, Chris Cabrera and Myra presented Paula with our heartfelt thanks for her outstanding leadership as president over the past year. The June Gala event was a shining example of a beautiful kinship of the past, present and future. Please check out the two-part video under “Past Events”.